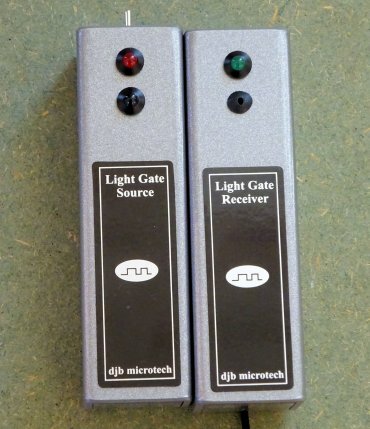 The Light Gate comes in two parts - the Source and the Receiver. The Source connects directly to a DIN socket on TSA or ALBA. 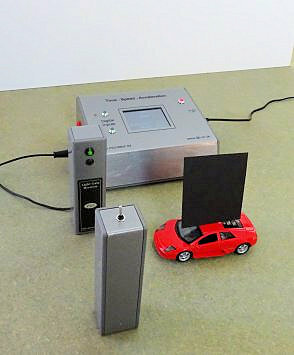 It uses a photodiode which has a daylight filter. This means that pupils working in a lab near a window should experience no problems with ambient light. The Source was originally a lens end bulb but this has been replaced with an infrared source with the result that battery life is now much longer. With the infrared source, separation distances of up to 50cm between the Source and Receiver are possible. Much greater distances can be achieved if the Source is replaced with a 'Mag Light' type torch which can be focused. Do not use an LED torch or laser as these do not emit infrared.